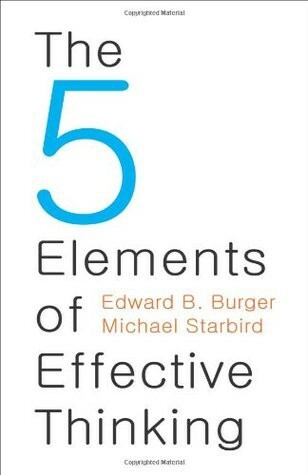 “The 5 Elements of Effective Thinking” is written by Edward B. Burger and Michael Starbird, both of whom are professors of mathematics, authors of many articles and books and recipients of multiple awards including excellence in teaching. There are five chapters devoted to each of the elements. This is followed up with a summary. Each of the chapters has plenty of practical advice as well as anecdotes from history and from the authors experiences. The authors experience in teaching shows through in the book. It is structured in a fashion that makes it easy for us to read, learn and implement the five elements. In fact, the authors have recommended that this book be read thrice. The first time is for perusing and understanding the big picture. The second time through the book, the authors recommend that we sit down and do all the exercises. The third read will be where you make the five elements part of your second nature. I like the fact that unlike other self-help books, this book is practical. The authors have understood that most readers will need help in implementing these high-flying concepts. So, the exercises in the book are frequent, helpful and are easily doable in whatever walk of life we may be in. Most self-help books tend to be verbose. Their authors run out of things to say and pad up the book to two or three times of what is necessary. ‘The 5 elements of effective thinking’ is different. I have seldom read any book which is as to the point as this one. There is no unnecessary fluff and all the content is relevant. This is good since it is a book that needs to be read deeply and often. The writing in this book is excellent — there are many powerful sentences and insights offered. These sentences tend to resonate with the reader since they are drawn from experience. The authors have made these concepts easy to understand. In fact, they have given us a neat mnemonic (Earth, Fire, Air, Water & Matter) by which we can remember these when we put them into practice. Finally, we come to the concepts themselves. These five concepts are brilliant. I felt that these were all important. In mathematical terms, I thought that these five elements were necessary and sufficient. ‘The 5 Elements of Effective Thinking’ is one of those rare books which we can read over and over again and get new insights every time. This has made it to my all-time greats list and will be something I cherish.